Mighty Apple trades down 9% in pre-market. Catching falling knives is not a strategy we are overly impressed with. There is a longer-term trend line at the 135 area that should be the first big support to look for. Note that the sell off in 2012 took the stock lower by 43% from local highs back then to the lows in 2013 when this last trend higher started. 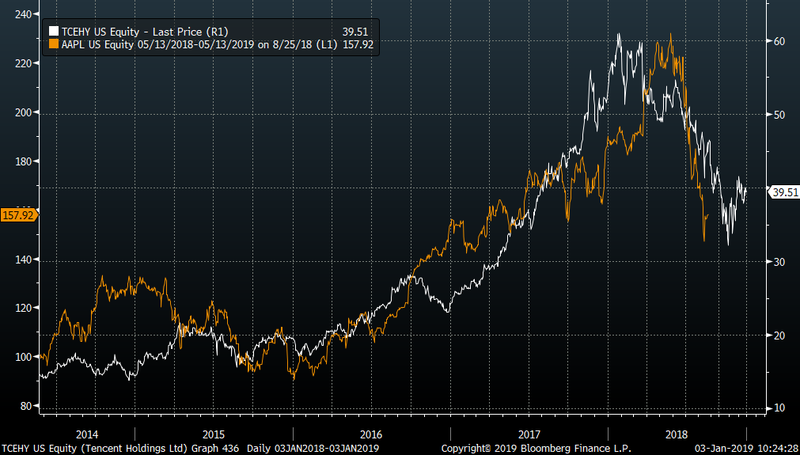 The stock is down substantially from recent euphoria highs, and it would be almost perfect to see it try the 135 level since that would be exactly the same percentage correction from recent highs as we saw the last big correction in 2012/13. No, the negative pre-announcement was not priced in (people still talk about it). A priced in event like this would not have the stock break to new recent lows, and Apple does not pre-announce in this fashion. Mighty Apple has missed earnings only 4 times over past 10 years. Buying this dip is basically getting in front of a fast train. Apple probably has value as a cash cow, but waiting for things to cool down is our preferred choice. Apple is big, but not big enough for a “quick” China/US deal, so that is not a reason to buy this dip neither, nor does the Fed care about Apple. CNBC, Bloomberg Tv etc are all bringing out pundits trying to rationalize the Apple move and how the mighty Apple Buyback should be doubled down and increased. These are only “hope” arguments and hold little logic in our view. Apple has deeper problems to think about than how to spend the money on buybacks. Apple has way too concentrated profits around one product, so they will most probably start looking for making deals. If Cook is a deals guy remains to be seen. The Apple warning is taking the entire market lower, especially the NASDAQ. Below is Apple versus QQQ 1-year chart. Note the chart will take another spike higher when US markets open. What people tend to misunderstand (still) is that all high-flying stocks reach the epic moment when it “all” reverses lower. The subsequent fall often catches most investors by surprise and the move lower often tends to continue for more and longer than most people can imagine. 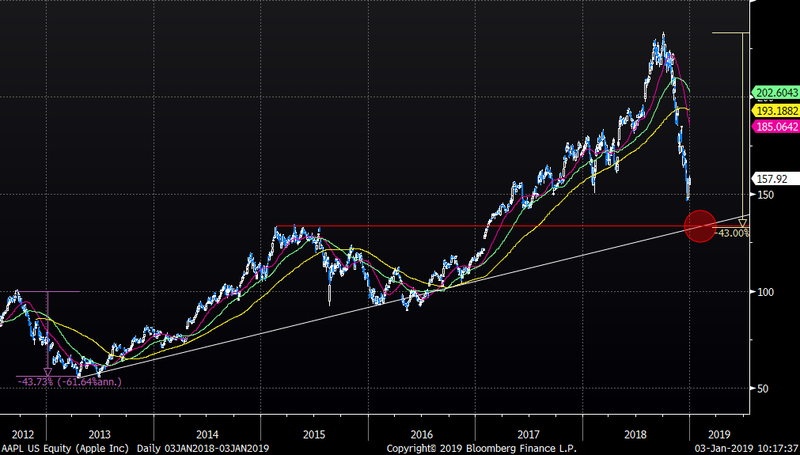 As we await Apple to try the longer-term trend, we are still a bit nervous with regards to whether or not Apple decides following the same “psychological” path as Tencent for the medium term. Apple is not Tencent, but the psychology of masses continues to be the same. 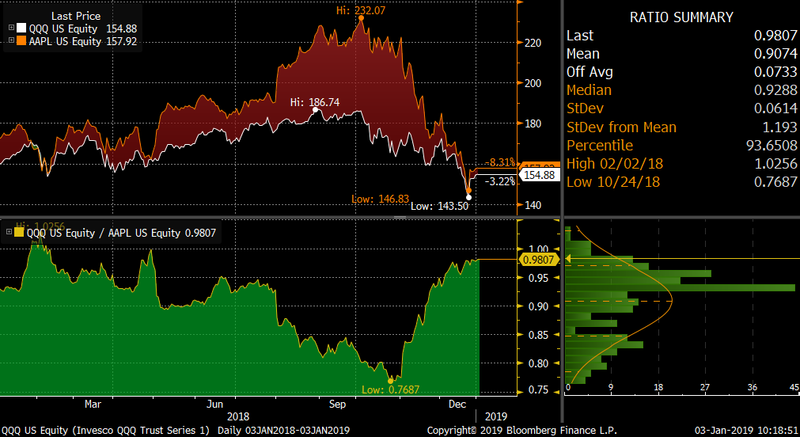 Below chart is showing Apple (orange) versus Tencent (white) on a date adjusted basis.